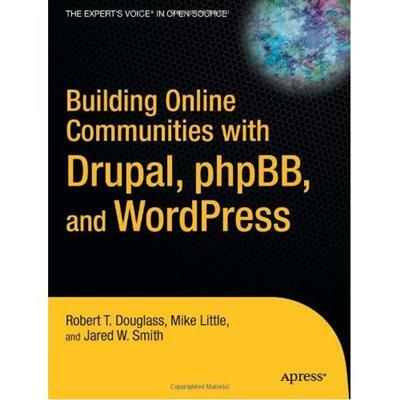 Building Online Communities With Drupal, phpBB, and WordPress | Free eBooks Download - EBOOKEE! Robert T. Douglass, Mike Little, Jared W. Smith, Building Online Communities With Drupal, phpBB, and WordPress English | 2005 | ISBN: 1590595629 | PDF | pages: 560 | 13,7 MB Content management, blogs, and online forums are among the most significant online trends today, and Drupal, phpBB, and WordPress are three of the most popular open source applications facilitating these trends. Drupal is a full content management system that allows you to create any type of website you desire, from an e-commerce to a community-based site. phpBB enables you to set up a bulletin board or forum. And WordPress is the software of choice for the exploding blog community. All three technologies are based on PHP and MySQL. Building Online Communities with Drupal, phpBB, and Wordpress is authored by a team of experts. Robert T. Douglass created the Drupal-powered blog site NowPublic.com. Mike Little is a founder and contributing developer of the WordPress project. And Jared W. Smith has been a longtime support team member of phpBBHacks.com and has been building sites with phpBB since the first beta releases.